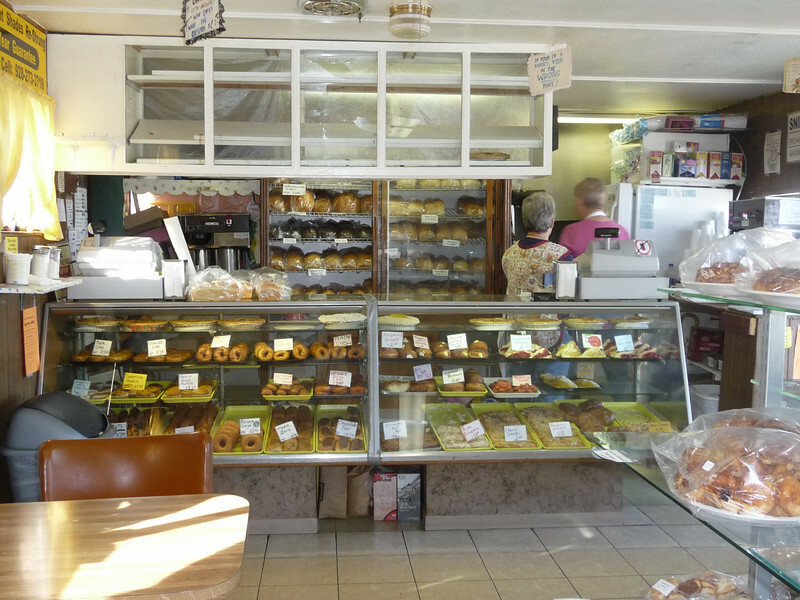 Getting coffee at the little bakery shop down the street. Browsing Beall's Outlet and Family Dollar where we picked up a few things. 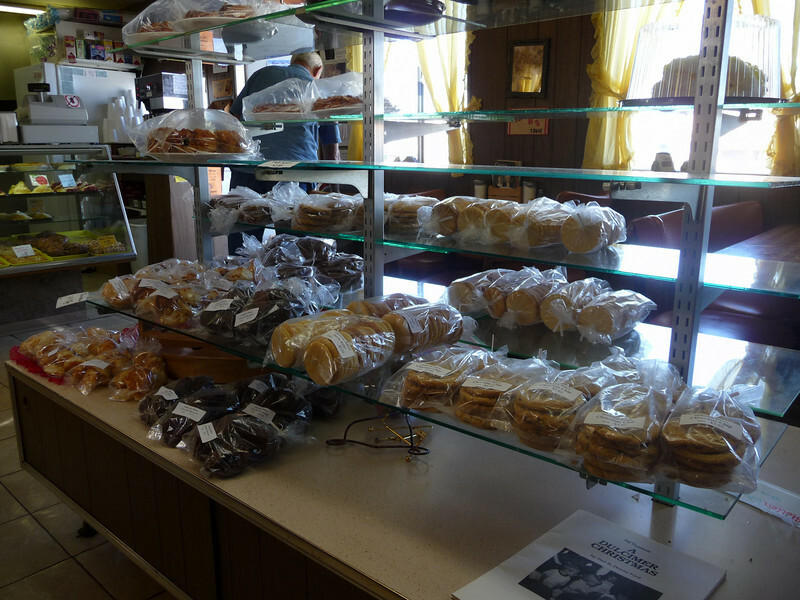 Getting coffee and pastries at the little bakery shop down the street....we sat down this time and enjoyed all the signs scattered around the store and above each table. 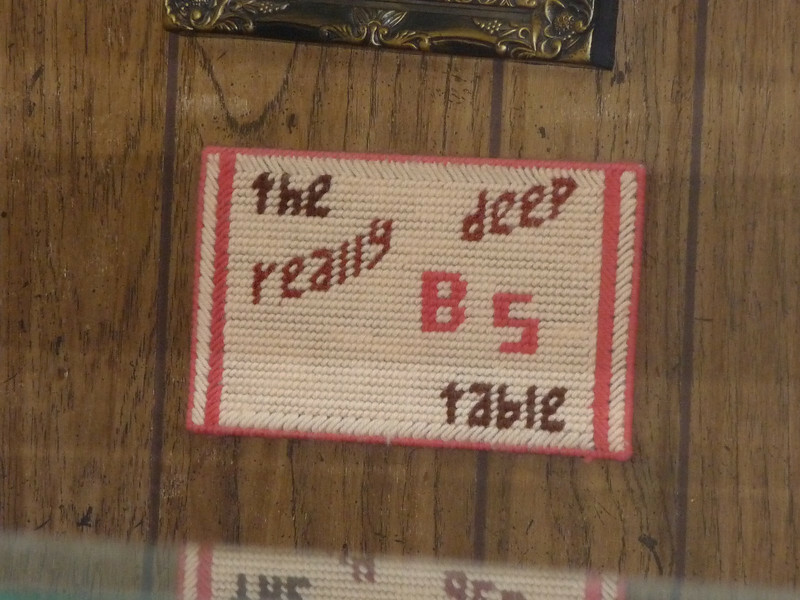 (see pics below) We were at the "Impossible" table. Checking out the local General Store...decent grocery selection for the basics. 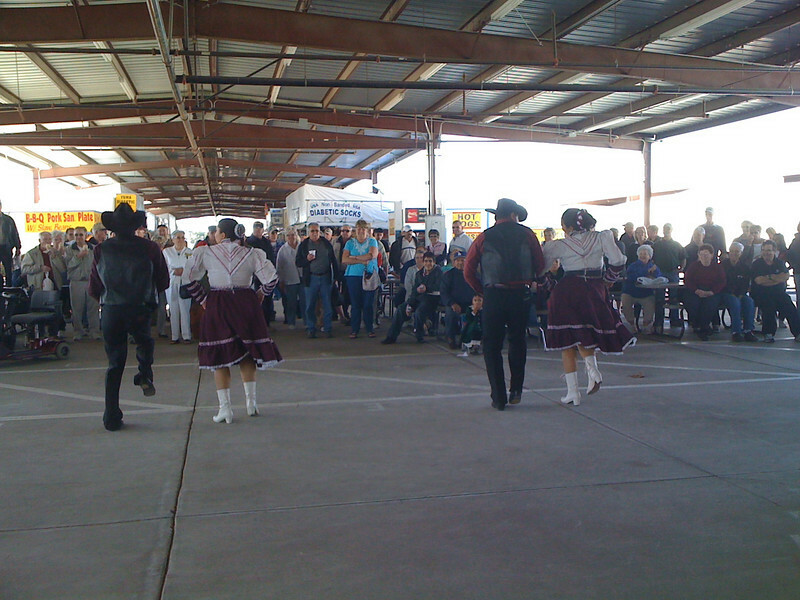 Quickly running through the little flea market set up beside the general store. Visiting with friends Dave & Leslie who stopped by to see us. We had missed connecting the last time in Q, so this was great. We chatted about a wide variety of things. They headed out as we got the walk-through on our solar setup. 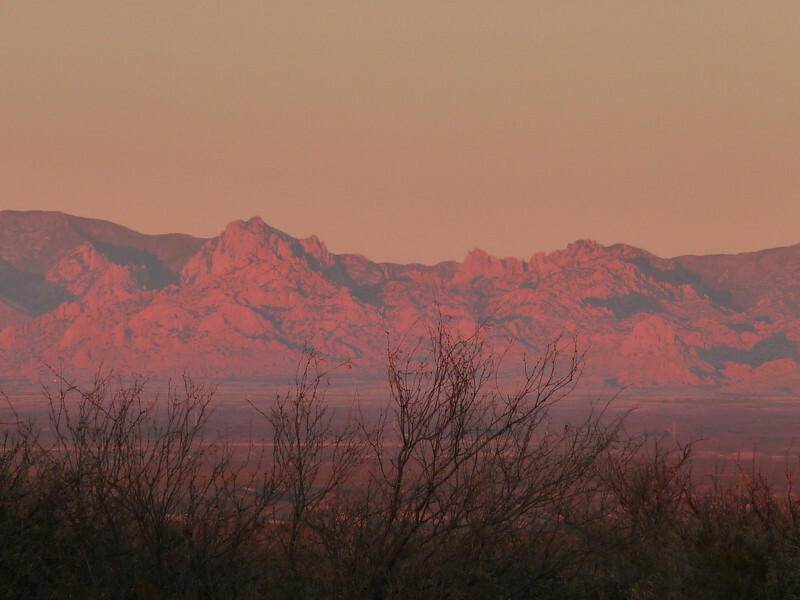 Enjoying the UNBELIEVABLE moon rise and associated sunset. (see pics below). 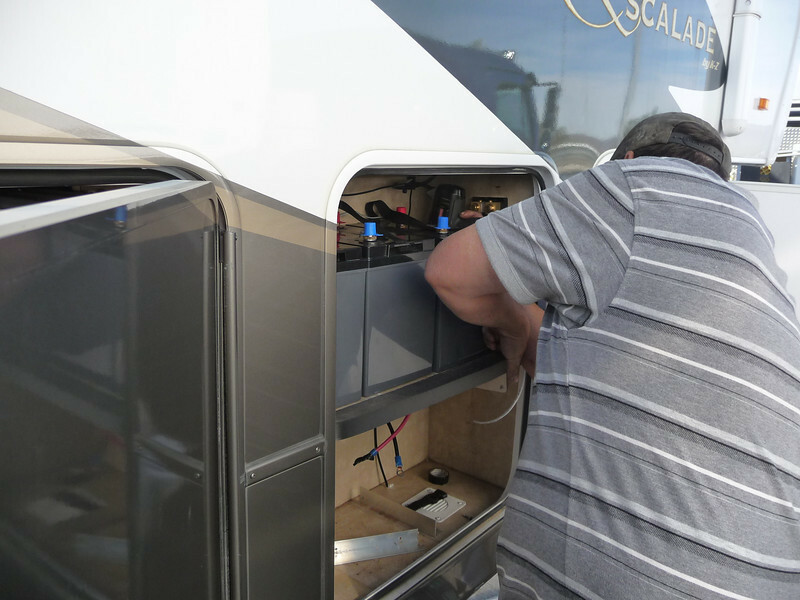 NOTE: Stu is doing a full blog on our entire rig setup and the details on the solar install. I will only list the basics here for those who are interested. We headed out to a different parking spot at Hi Jolly, a bit frustrated in choosing the best site due to it being dark. LOL! It had gotten cold and we ate up a bit of our battery charge running the furnace but our first night went well. We woke to batteries well above 50% (memory bad but think it might have been about 76%). Stu slightly moved the trailer to face more southerly and then raised the panels. First OOPS....they forgot to give us the braces for the panels. We'll have to pick them up on Monday. We did a little computer work and watched to be sure we were charging...and we were. 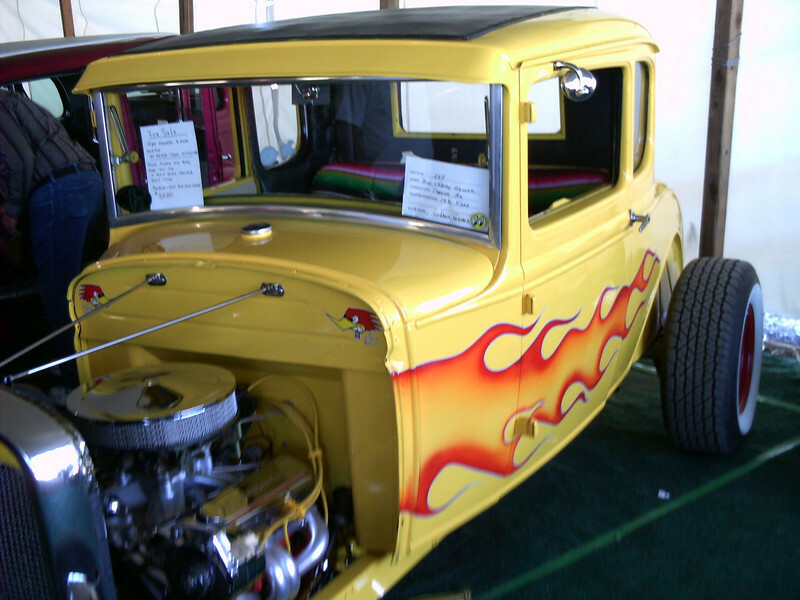 We turned off the inverter and headed into the car show. The weather was perfect so we headed out on the bike. We were almost there when Stu asked if I had remembered the camera....oops, nope! LOL! We did have the little waterproof camera on the bike so we opted to give that a try. Not the best for the day...out of 129 photos taken, only 62 were kept and some of them aren't the best but I kept them. Here are a few, the rest are at SmugMug. While there we ran into friends Mike & Janna from Montana. We had met when I was workamping in MT the summer of '08. We'd tried to connect while in Q earlier but again, that didn't work out. 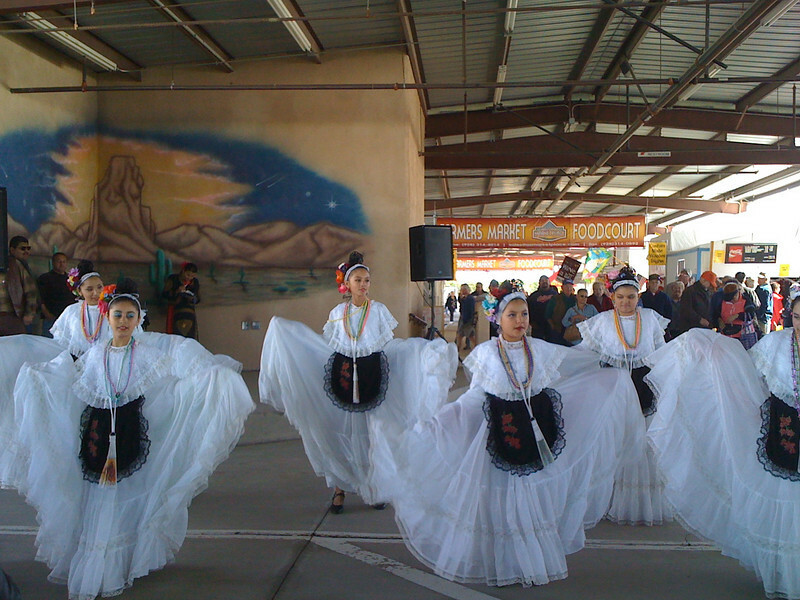 We had a great chat and look forward to seeing them again in Yuma area. 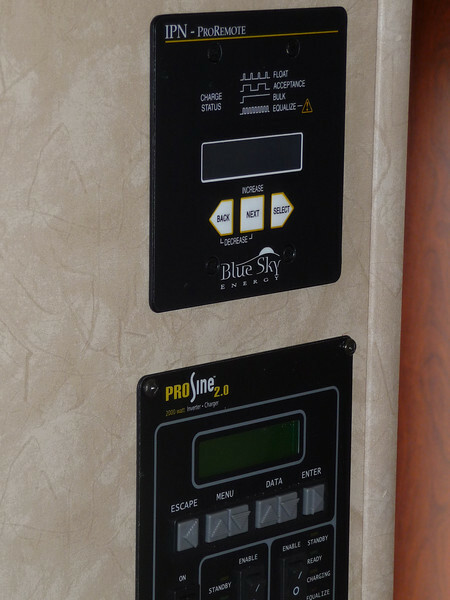 On the way back from the car show we stopped at Grandma's Heaters (north end of the parking lot at the RV Pit Stop) and picked up a 10,000 BTU Pro-Con Blue Flame heater. It will get installed when we get back from Florida. Until then we will use the furnace sparingly. We have converted most lights to LEDs and fluorescent but forgot the outside ones. 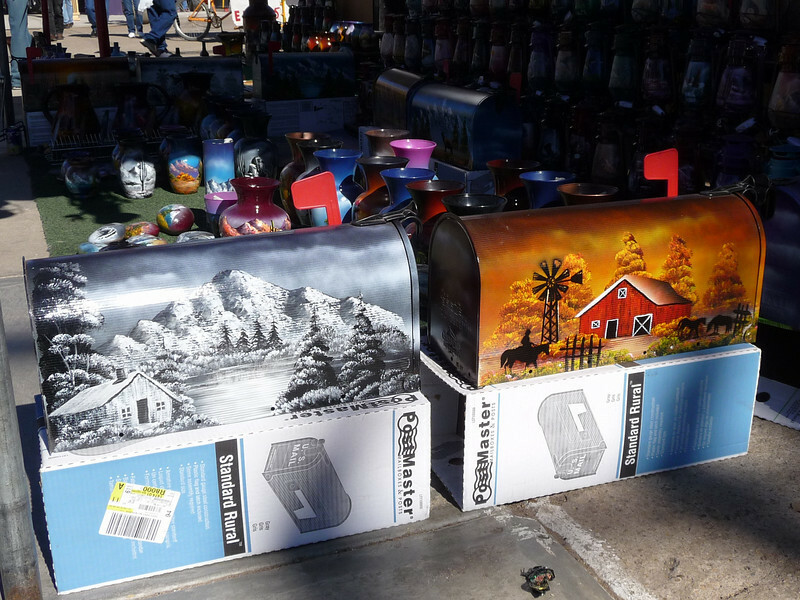 We'll get those when we are back in Yuma at the Arizona Market Place. When we got home we grilled some ground buffalo burgers, sweet onions and four colors of peppers. I've been playing with finding a marinade I like since eating with our friend Ara. I think I hit on a combination we both enjoy and we'll try it on chicken next. What didn't go on the veggies (grilled in tin foil), went into the burgers. Stu had the leftovers for lunch today and said it was still good! 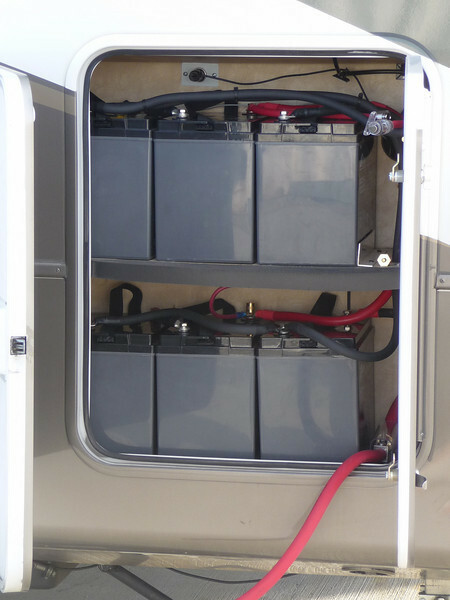 Sunday (toady) was our day of rest....the batteries are great and we've had the inverter on all day since about 8am. Both computers running, used the microwave a couple of times (for 1-2 minutes at a time only), now using the Blu-Ray and TV while Stu watches a movie and I blog. I did snag a couple sunrise photos. We find ourselves getting up earlier and going to bed earlier...a good thing! One last note, I haven't been posting daily updates on our walking but we are averaging a minimum of 30 minutes (3,000 or so steps) up to 2-3 miles (9,500+ steps) every day. We are both seeing a difference...both in how our clothes are fitting (especially Stu) and our arthritis. Still have to grab the Tylenol and Aleve but it's worth it. We are both committed to getting stronger, healthier and hopefully a little thinner before this year is out. Processed food is getting shunned as much as possible, trying to eat out less, and doing more healthy cooking and eating. Viva 2010! PS. As always, check out all the photos in our SmugMug galleries. Long day, lots of vendor browsing done and a little buying as well. Stu bought a great new hat. Got the rig into Hi Jolly by 7pm. Both beat but enjoying our new solar setup. Details and pics to follow. Got to spend some nice visit time with full-timers, Leslie and Dave. All is well! This morning was spent running last minute errands (minor parts for the RV & groceries). 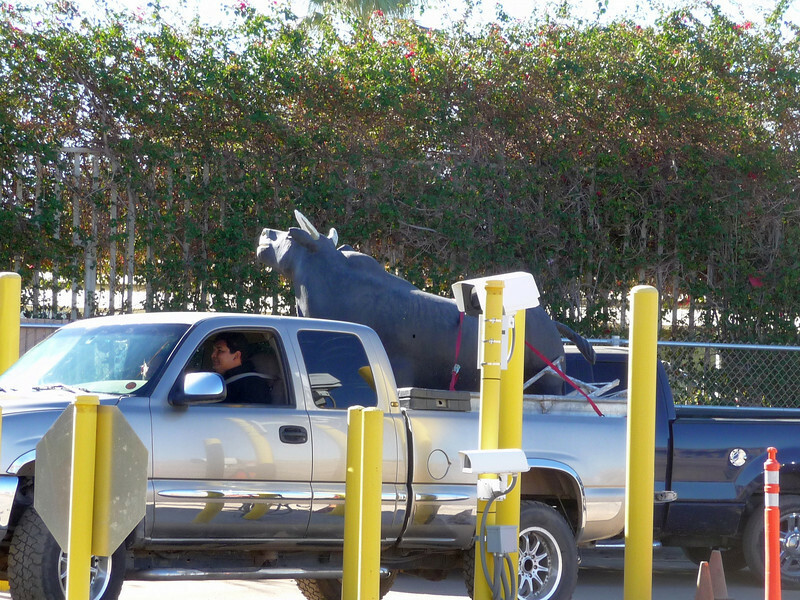 Then it was time to load up, pack it in and head on out. We made it to Hi Jolly in Quartzsite about 6pm, picked a spot near the road since we will be heading out about 8:30 in the morning to get propane and then head to Discount Solar for our all day install. It was still light so we headed out for our 30 minute walk. We're trying to stay around 5,000 steps a day right now and hope to eventually hit the 10k that is recommended. We've managed 30-60 minutes of walking almost every day and want to continue that. Anyway, not sure when the next blog will be. Maybe Sunday or Monday night. 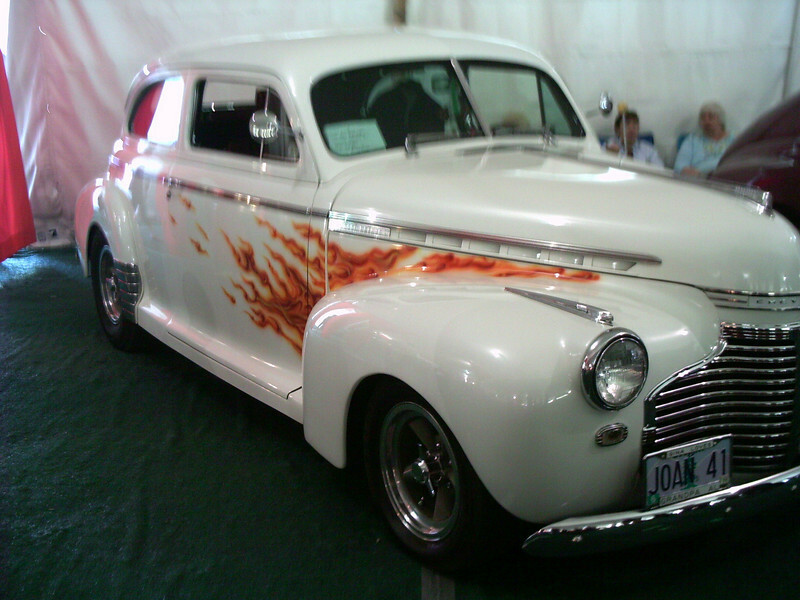 We plan to attend the Classic Car show on Saturday and Sunday before heading back to Yuma and the new RV lot on Monday. Tuesday we head to San Diego for our flight to Orlando where we spend a week. So don't give up if you don't hear from us...we're just too busy having fun! LOL! 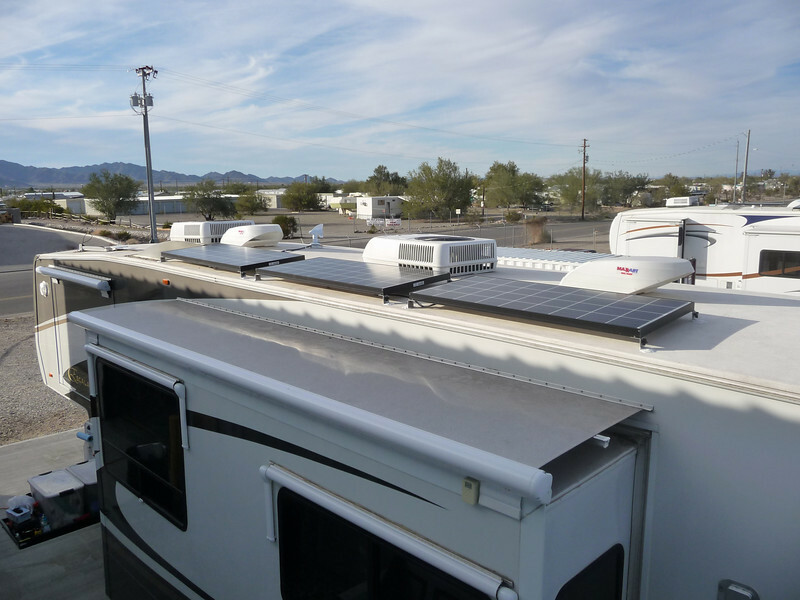 Stu still plans to do a blog about our truck, RV and now our solar setup...just don't know when. Well, this has been a fun week here in Yuma. We didn't get our HD TV dish installed....they have to run two new lines and there wasn't time in their schedule to do that. So once again, the sands have shifted under our feet and our plans have been adjusted and adapted to fit. We leave Yuma tomorrow afternoon for the 90 minute ride back to Quartzsite. Our solar install is on Friday and that will be an all day event. 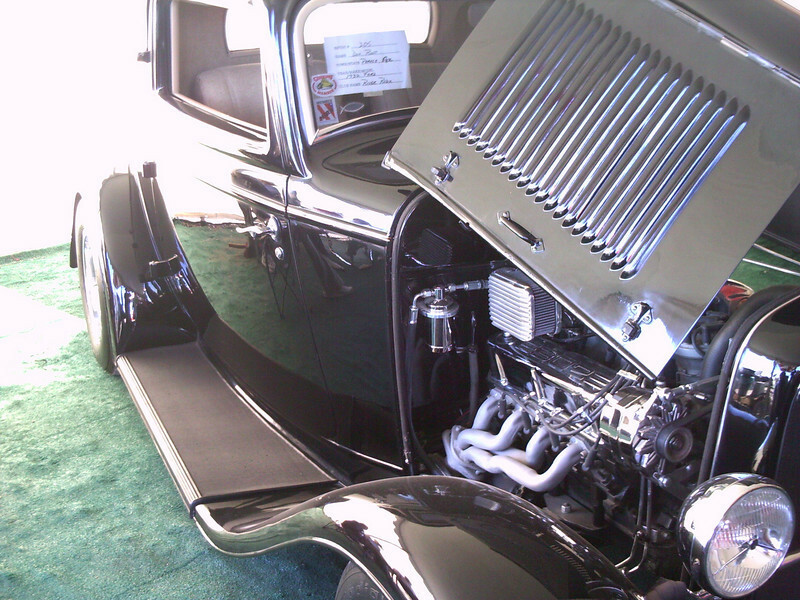 But since the Classic Car show starts then, I don't think we'll be too bored. 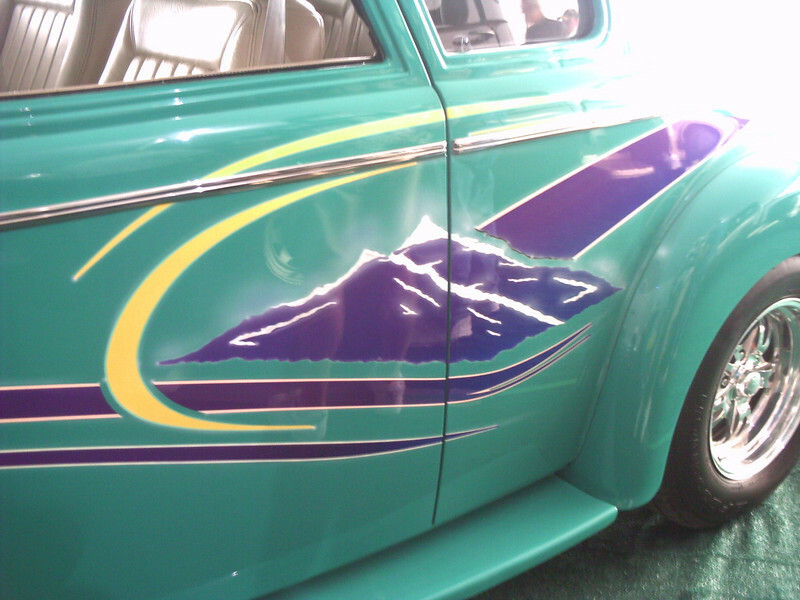 Not sure if Stu will want to leave during the install, if not we'll do the car show on Saturday & Sunday. 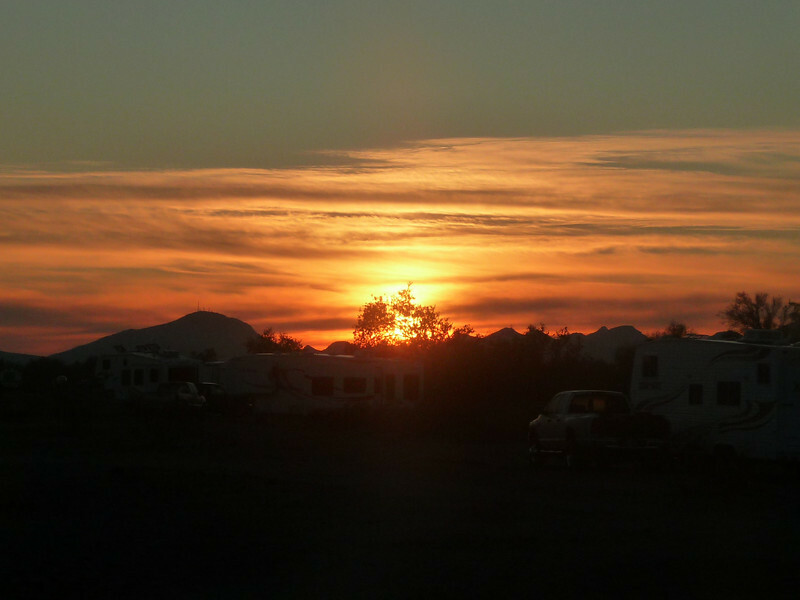 Monday we head back to Yuma where we have rented another RV lot for the month of February. The price was right although the location isn't quite as nice as the current site. We no sooner get parked then we drive to San Diego for our flight to Orlando for Stu's retiree gathering in Orlando. We'll hotel it the night before the flight and leave the truck parked at the hotel. 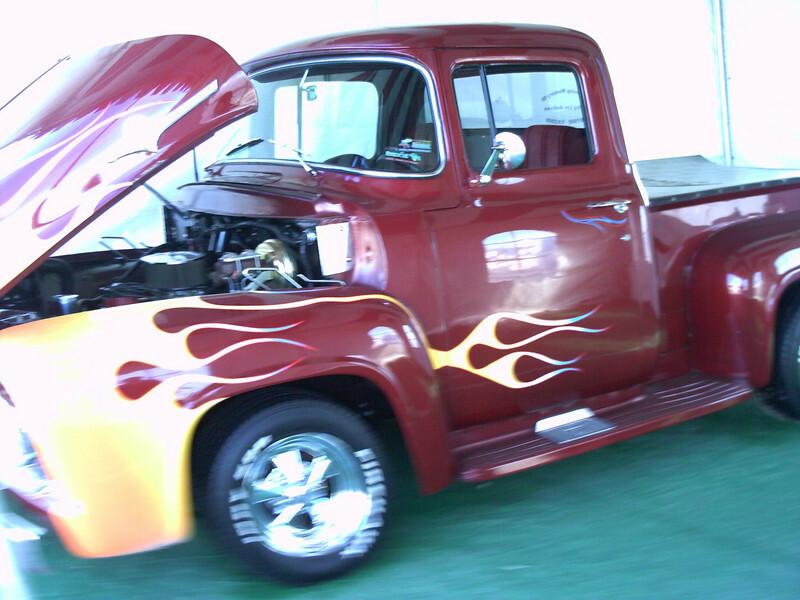 We'll be gone a week before returning to San Diego to pick up the truck and head back to Yuma. 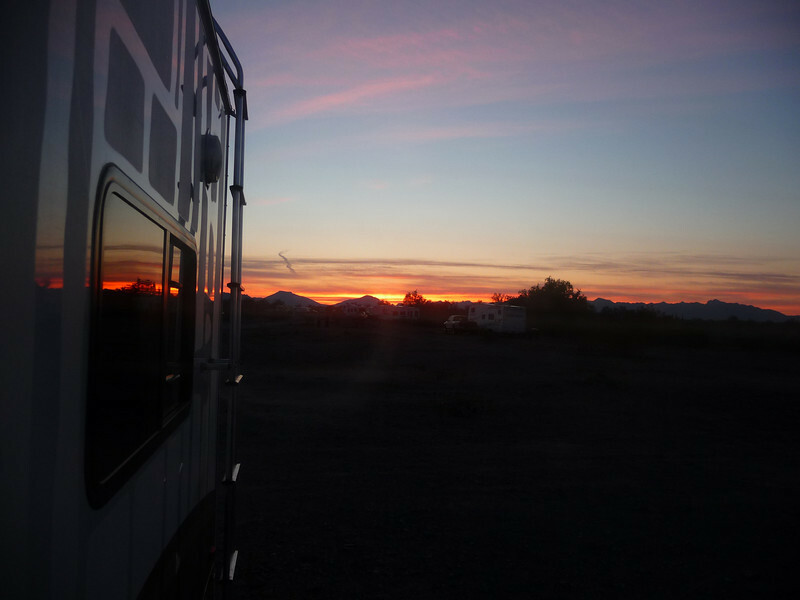 The end of the month we will leave the lot early and head towards Bullhead City for a week. The RV will be parked while we motorcycle up to Las Vegas for the Garth Brooks concert. In addition we will see The Lion King. Good time expected! Anyway, I'm hoping to catch up with some of the missed folks in both Q and Yuma with this new schedule! We woke to a perfect morning - crisp, clear and sunny. 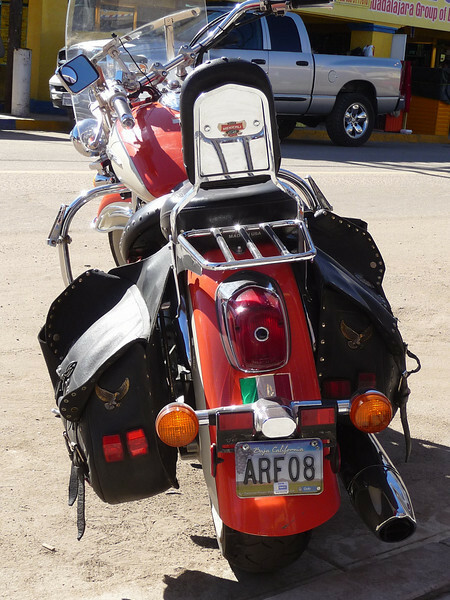 At 10:00 we headed out to Los Algodones, Mexico with our friends Dave & Renee and Gar & Jan. We all are Harley folks although not everyone is riding right now. Since we are all full-timers as well, there was always something to talk about. We rode with Dave & Renee in their Jeep and Gar & Jan followed in their convertible. 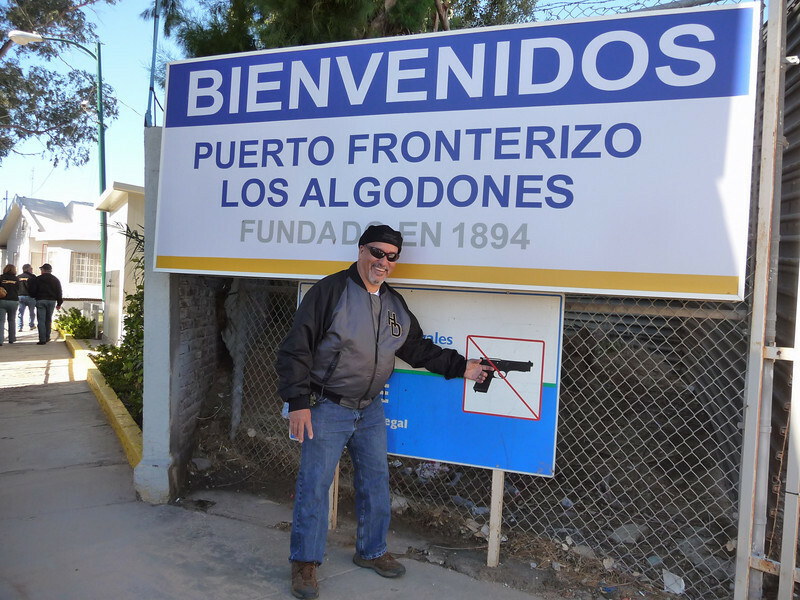 We are all staying on the east side of Yuma and the border into Los Algodones is on the west. Traffic was light and we zipped along, quickly arriving at our destination. The parking lot was all but empty...not sure if this is a sign of the times or just a normal Sunday. We walked across together and as usual, Stu managed to make just the perfect pose for us...LOL! 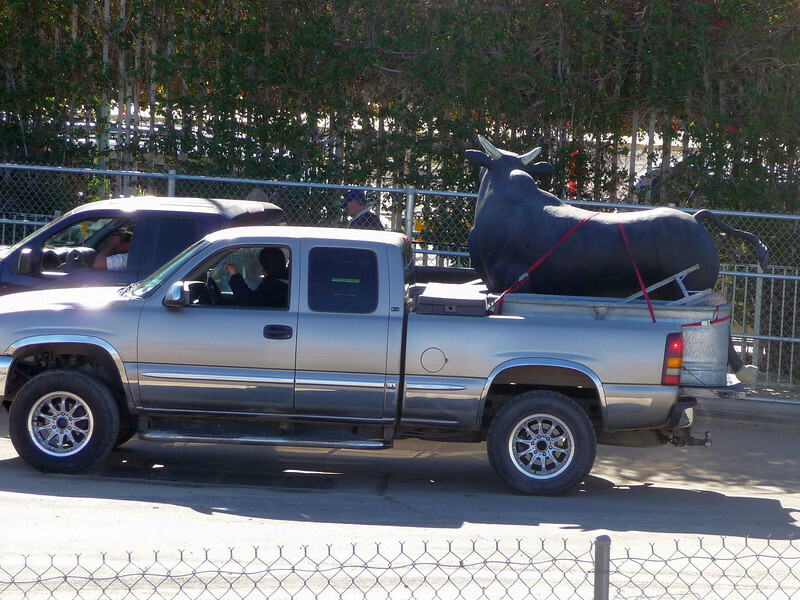 I couldn't resist take a shot of this "bull" on the back of a pickup truck. From there we split up to roam, sightsee and run various errands. Jan & Gar needed to get meds, Renee & Dave were looking for salsa dishes and we were just looking. We planned to meet back in 90 minutes for some lunch. Here are some local shots I took...the rest are in the SmugMug album. We'll go back...we both liked it a little more than Progresso. Much less police presence...we saw a couple cars and two nice officers just as we entered. They wished up a good morning and smiled...very different from Progresso. LOL! Two days in a row...lots of sun, a little wind and comfortable temps. 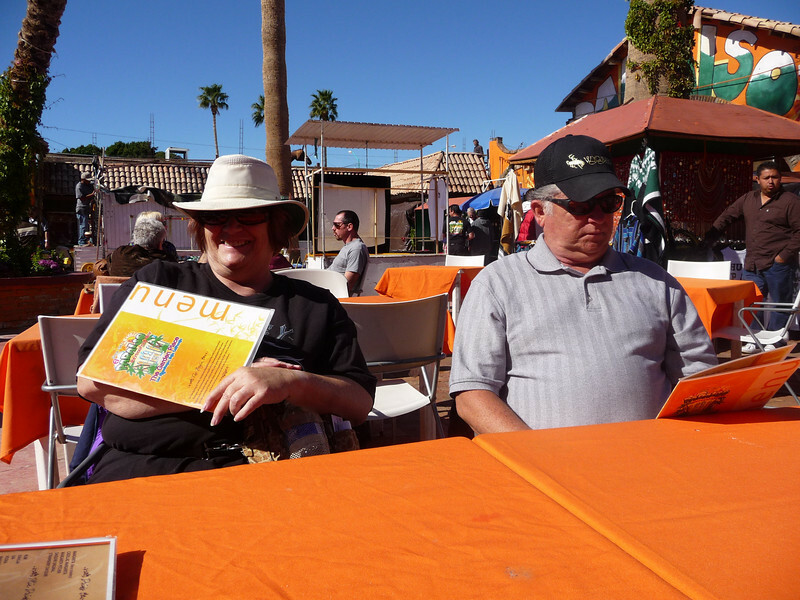 We headed out to the Arizona Market Place once again, where we would meet up with friends Gar & Jan, originally from Wyoming. I met Jan in 2005 on my motorcycle trips, I had known her several years from an online lady rider forum. The next time I bumped into her was at the Escapade in Gillette. 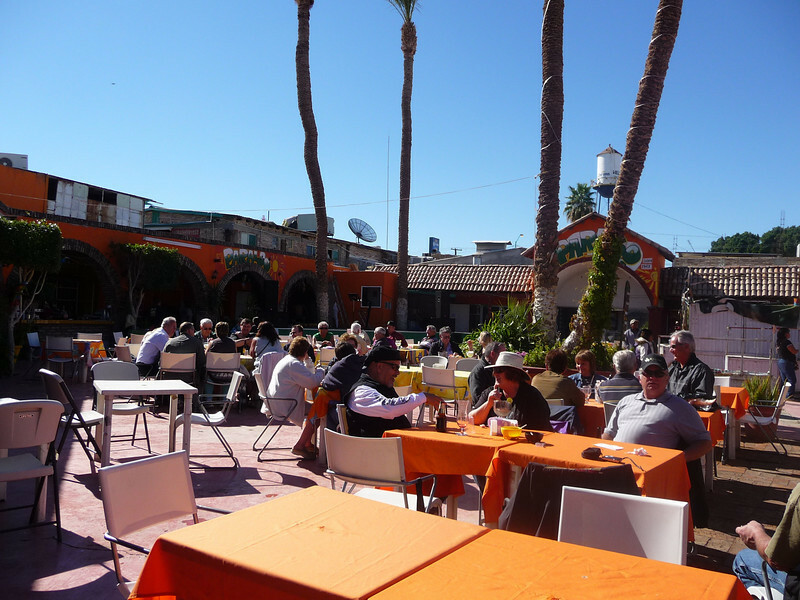 We spent a couple of hours chatting, grabbed some lunch at the food court and made plans to go to Los Algodones tomorrow. Our friends Dave & Renee are going to join us...should be fun! 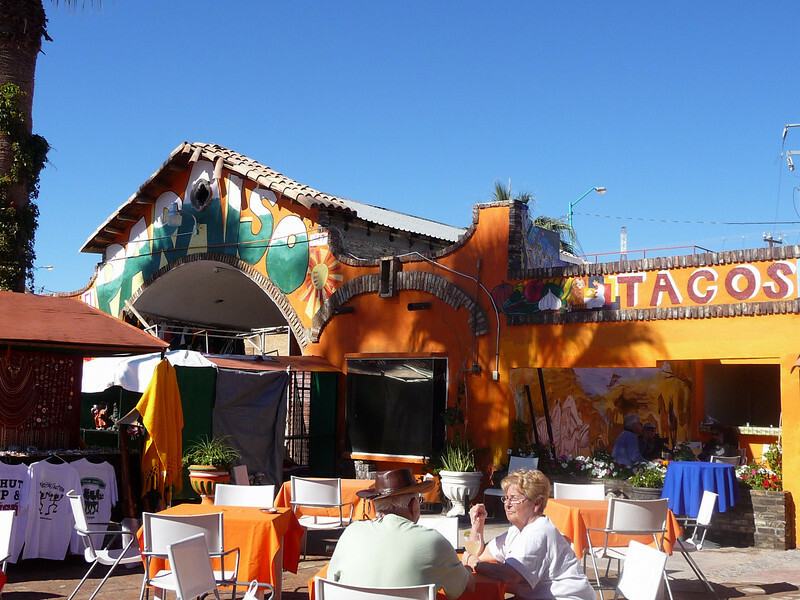 You can read about my first visit into Los Algodones in my old blog. 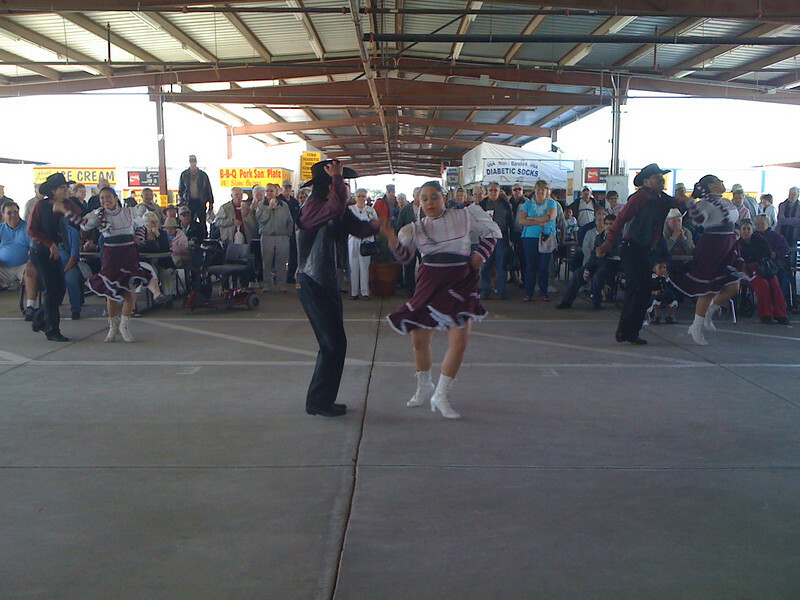 The market was busier than yesterday and the entertainment was wonderful! Here are a couple of pics I snagged on the iPhone. 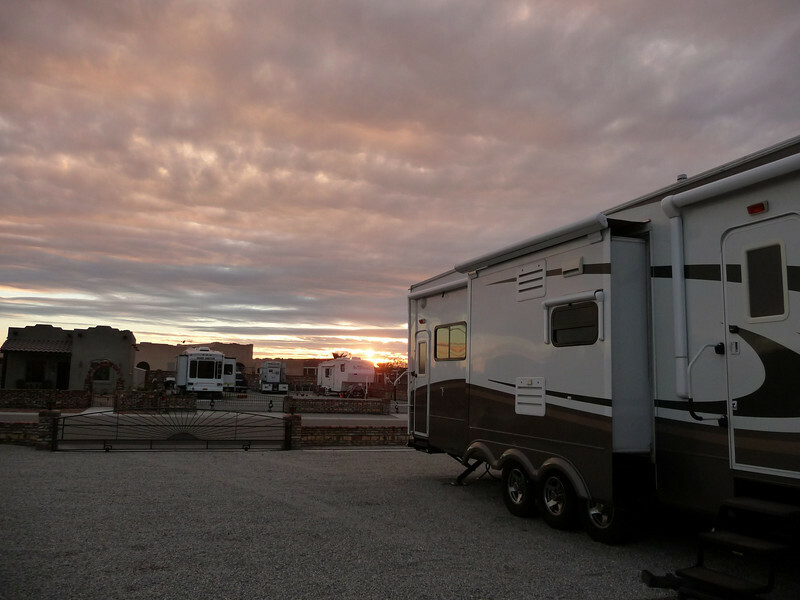 And here are a couple of our rig in the lot we rented...the sun is setting. And a couple more of the local scenery as we head out of the development. I expect to be beat by the time we get home tomorrow so don't expect another blog till Monday some time. LOL! Oh, another side note to all the folks we missed in Q. 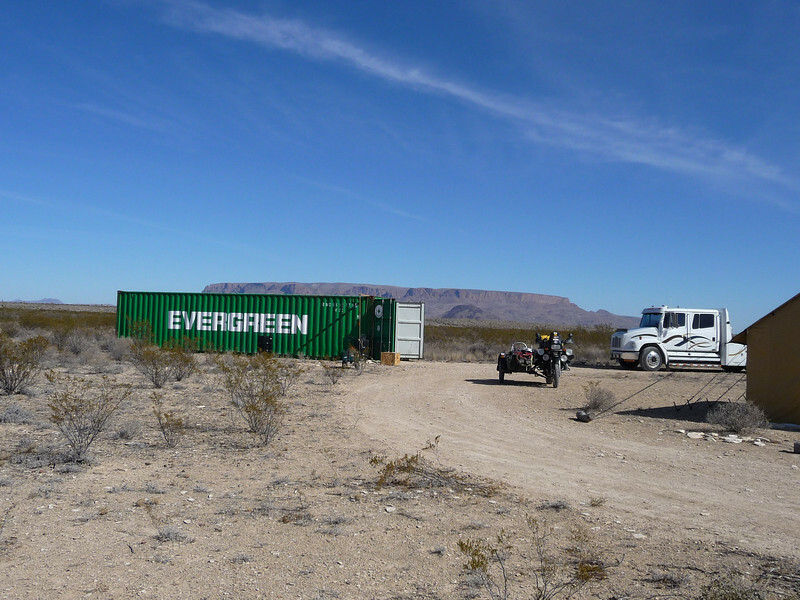 We will be arriving back late Thursday afternoon, will get our solar installed in Friday and will head to San Diego on Sunday. 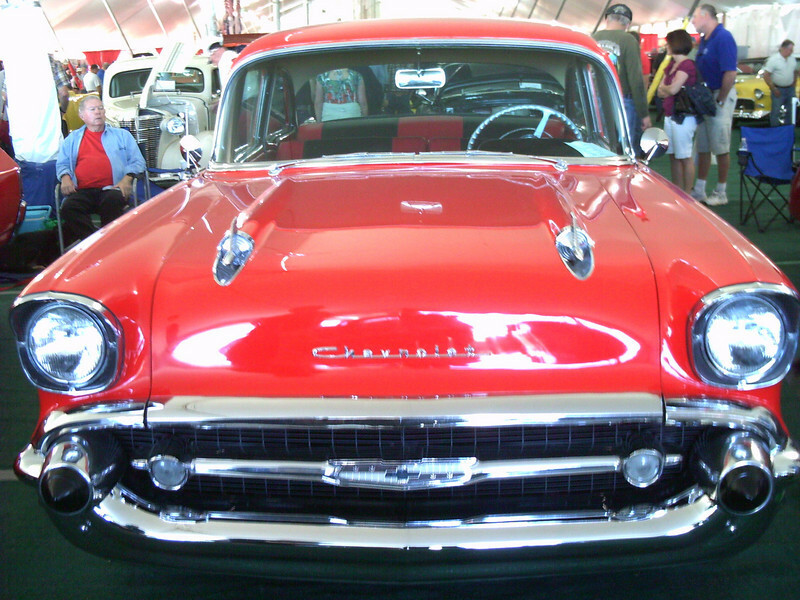 We plan to visit the classic car show on Friday (maybe) and Saturday. Anyone interested in lunch or dinner....email us!! Not sure why I used that title other than it's the only movie I know that has Yuma in the name...LOL! We survived the bad day of weather on Thursday..we were glad we were here. The weather was even worse in Quartzsite. We did pull in two of our slides and never put out any awnings. Lots of rain and wind gusts of up to 60 mph. Phew! Yesterday was catch-up day. I fasted and we went into town to get my bloodwork done. Oops, the lab was closed due to water damage! Will give them a call on Monday and may have to find another spot to get it done. After that we headed to Penny's Diner for some breakfast, a little pricey but it turned out to be a chain. We did get a nice coffee mug there, added to our collection from The Shed in TX, one from Cabela's and a Life is Good mug. Then we hit Home Depot where we got Plexiglas to turn our screen door into a storm door, Staples where I picked up a lapdesk for the laptop and Harbor Freight Tools where Stu picked up several little things. 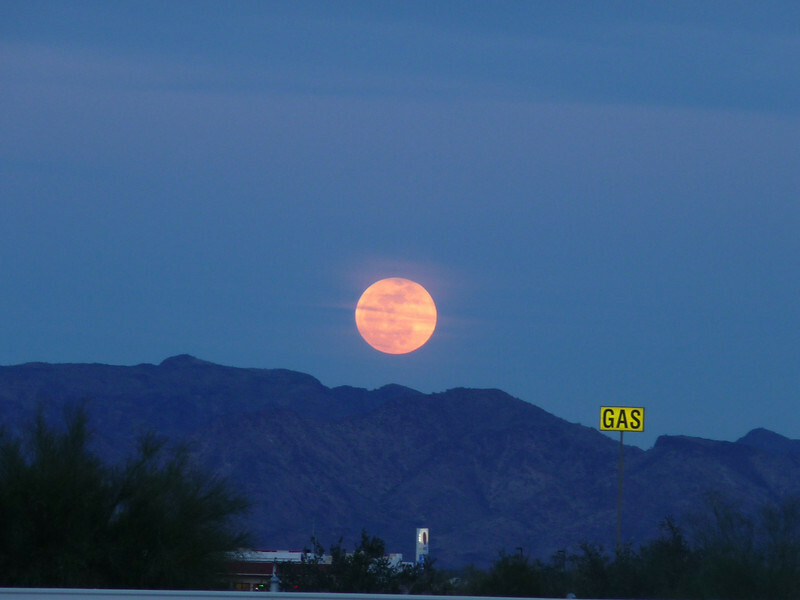 From there we headed to the Arizona Market Place to look for our LED bulbs. 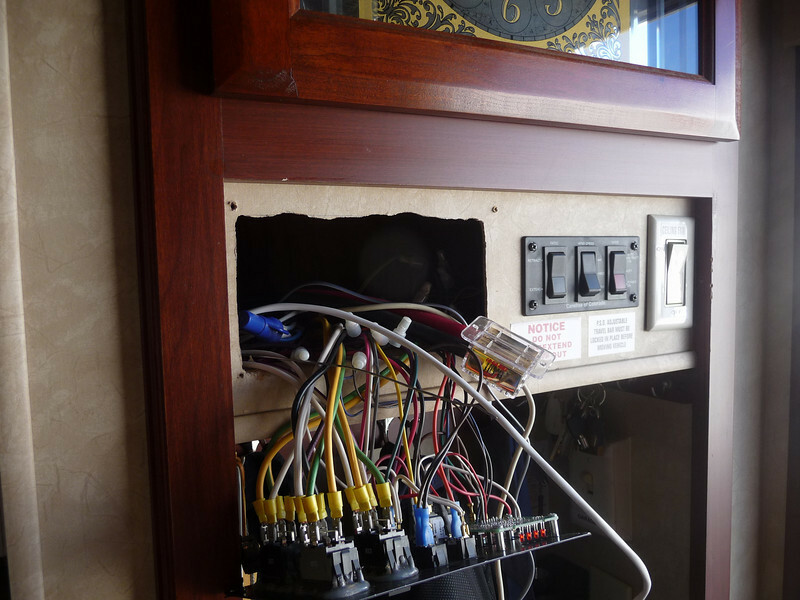 We quickly found the spot and got what we needed...now all our bulbs are either LED or fluorescent which should help when boondocking. We wandered all the vendors but time was short, many were closing for the day. Back home for a quick dinner, we headed back into town to see "The Daybreakers", a slightly different twist on vampire flicks. Interesting, bloody but good. The Wal-Mart was on the way home and we knew it wouldn't be crowded that late in the evening so we stopped to pick up a few things. Today we head back to the market place where we will meet some other Escapee friends. Then who knows what the day will bring! 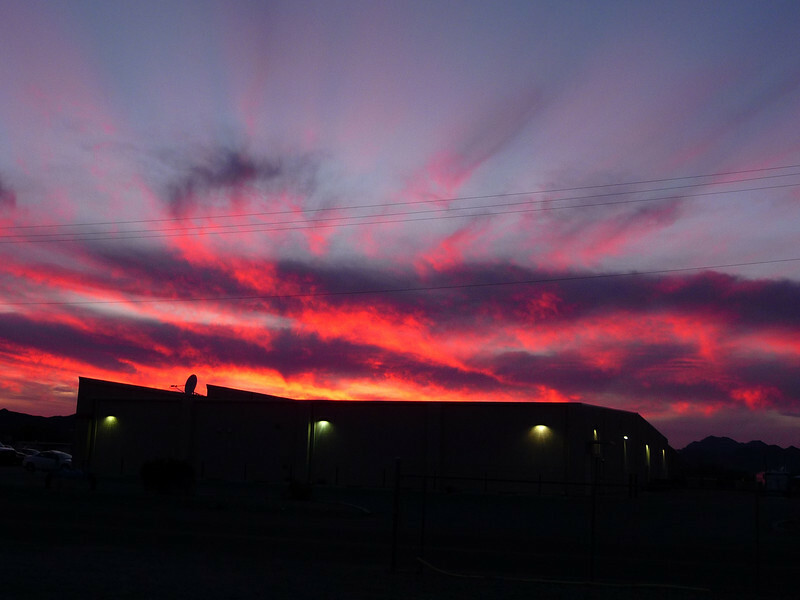 We had a wonderful if short time in Quartzsite. Stu enjoyed it as much as I did and has come over to the dark side. Yup, we'll be getting solar installed the end of this month. 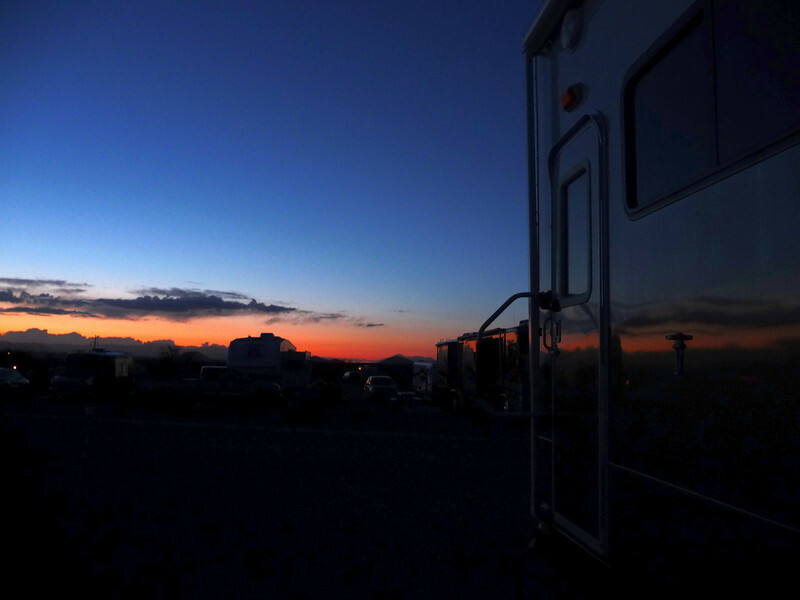 We know there will be some lifestyle changes involved but we look forward to getting "out there" and boondocking. Our initial use will be a little sporadic since we already have several things booked on our calendar, but we look forward to using quite a bit as we travel AZ, UT, CO, WY, MT this spring and summer. We made a couple of purchases while at Q, one is a telescoping flag pole for the American flag. It comes with the attachments for an additional flag but we're not sure what that one will be. We've talked about a TN state flag (our future home sometime in the next 5-10 years or so), something related to firefighting or something patriotic. Time will tell. We also ordered a solar light ring for the pole. We looked at getting a DirecTV HD setup for KaZy (she deserves it...LOL!). After getting Blu-Ray we quickly got spoiled. We found a good price at the show and turns out the dealer has a store in Yuma. We're going to see about getting that set up as well. One other thing we looked at were LED light bulbs, both for our rig and for our friend Ara. The bulb we needed was completely out of stock at all the vendors, the bulb that Ara needed was pretty pricey. 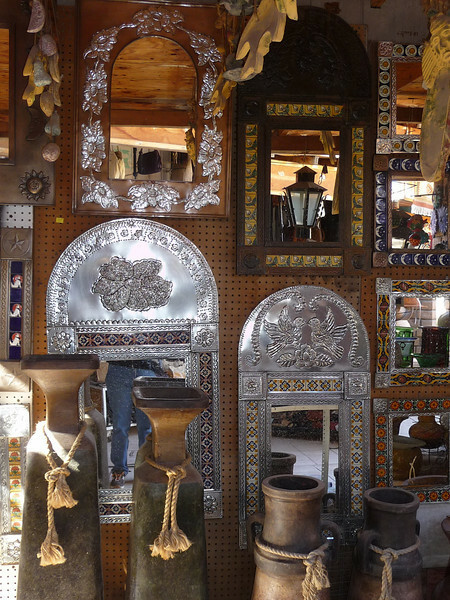 BUT we found one vendor who sells here in Yuma at the Marketplace (Flea Market). He told us the bulb we want is cheaper there than he was selling it at Q....AND if we got the bulbs Ara needs as well, he'll discount the whole thing. So guess we'll be going by there this weekend. The RV lots here are VERY nice....and the neighbors are terrific. Most come for the season and repeat every year and I can see why. We met up with our friends Dave & Renee, they are the ones that told us about the lot rental. We had met them in Gillette, WY at the Escapade where Stu & I met. Going to be fun to spend a little time with them. 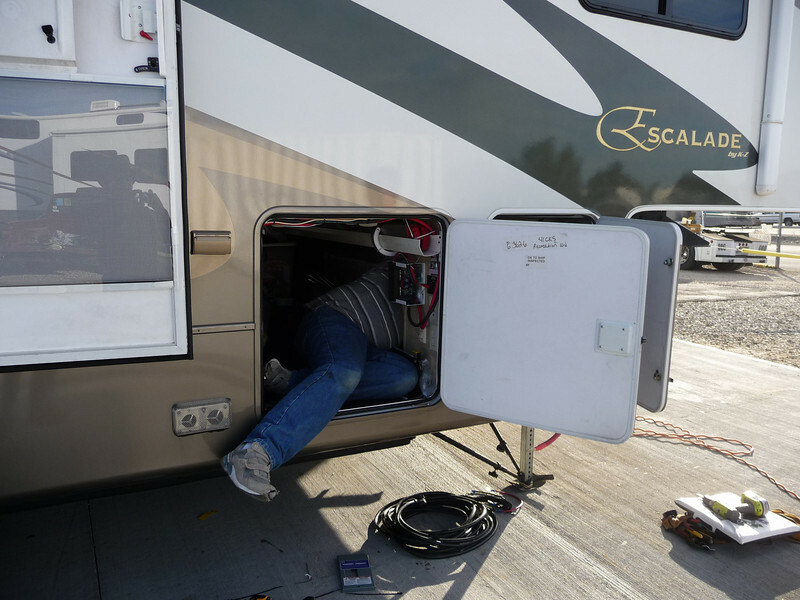 They may be headed to Kansas next week to pick up their brand new New Horizons fifth wheel. We also have a friend that I have known for 7-8 years that is within walking distance of our lot. I look forward to seeing them again as well. They sold their ranch in WY and went full-time. Last time I saw them was at the Escapade as well. They had a rough year so I'm hoping that is changing for them now. Well, the rain has settled in....but we're all snug, the laundry is caught up and this blog is coming to an end as my eyes are sagging. Been a busy couple of days. 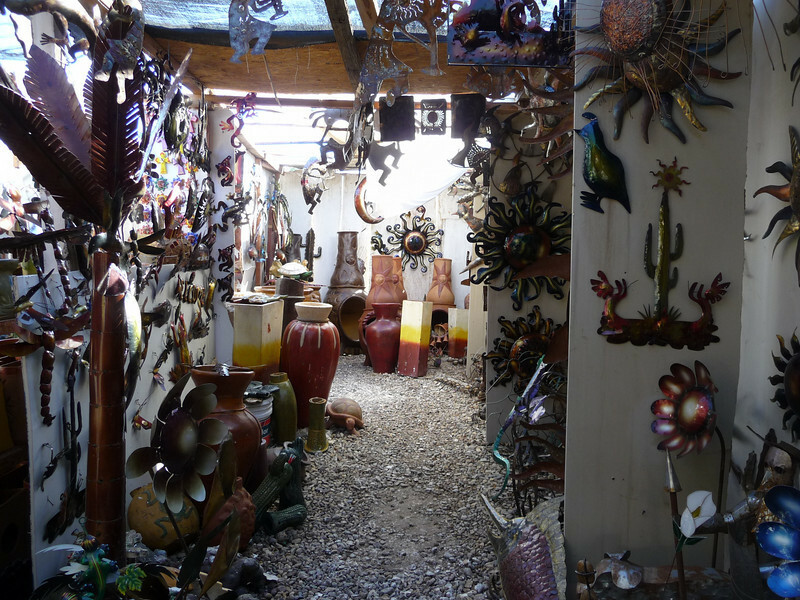 We had a nice stay at Augie's Quail Trail in Gila Bend, managing to connect with some folks I met two years ago at the RV Life on Wheels in Tucson, Linda and Dave. From there we rolled onward towards Quartzsite or "Q" as those in the know call it. LOL! We made a Wal-Mart stop in Buckeye at I-10. Got everything we needed and more, as usual. 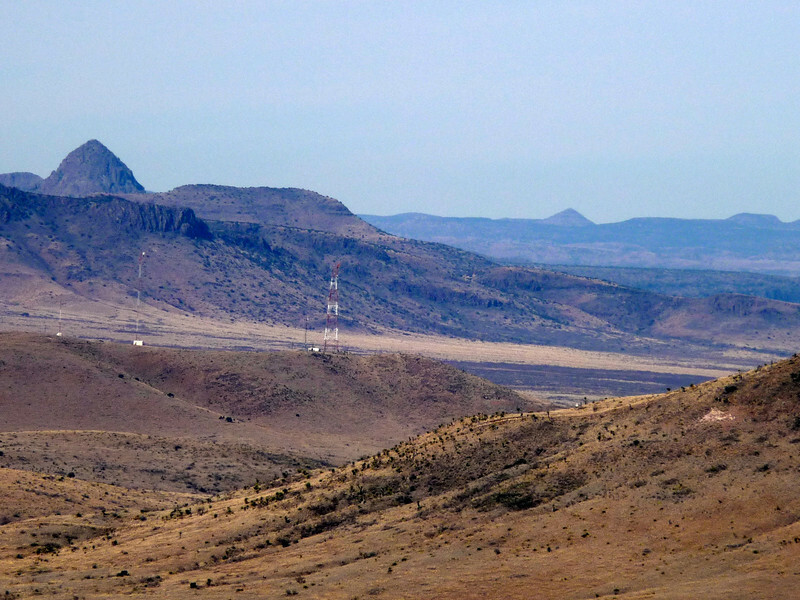 Before we knew it we were coming over the mountain to the vista of RVs spread far and wide. Quartzsite...the annual mecca for RVers. 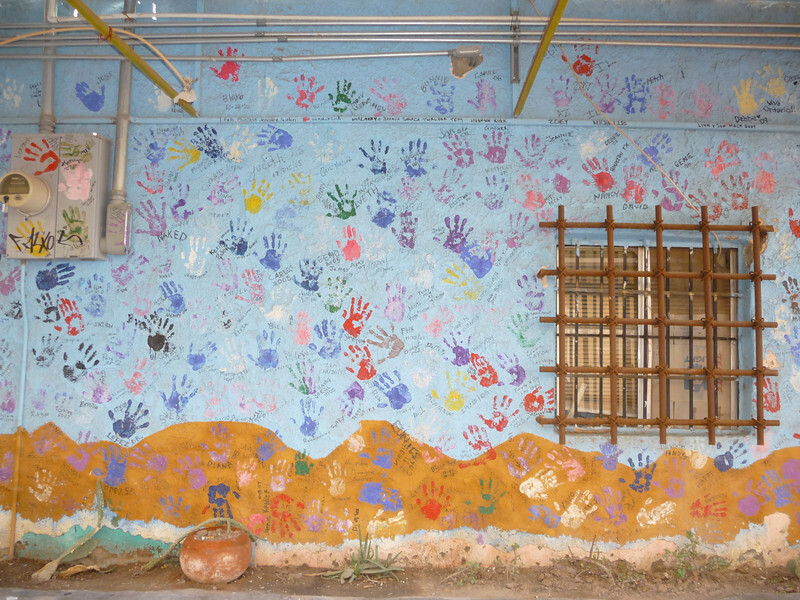 We planned to stay at at 14 day BLM area named Hi Jolly. We had a good friend, Sharon, from the Escapees staying there and wanted to reconnect. We called her at the entrance and let her know we were headed to find a parking spot. She was close to the front where it was easy to get her motorcycle in and out. She was just getting ready to go for her daily ride so she jumped on and found us as we parked. Stu unloaded both our bikes and the three of us headed out on a scenic ride to Bouse. Gorgeous ride, perfect weather and great companions...what more could you ask for? On the way back we pulled into the SOLOS camping area and said hi to those we knew. Then it was back to the campsite for the night. We finished getting set up and enjoyed the rest of the evening in comfort...after a nice walk of 30 minutes or so. Sunday morning we got up, ate and headed out for another 30 minute walk. We stopped by Sharon's place and let her know we were heading out for our lunch with my Rumble Sister friends. Three bikes and two cars - Stu & I, Sharon on the bikes and Rumble Sister Marsha, her hubby Marion and Sharon's former in-law relative, Bob in the cars. We went to Silly Al's for lunch...expecting maybe a dozen folks and ending up with 18. NICE lunch...always wonderful to meet up with good friends and make new ones. Oh, can you tell...no camera so no photos...LOL! Most of us forgot them but a couple remembered and hopefully they will post photos so I can snag one. Anyway, it was a great lunch and too short a time to really visit with everyone. 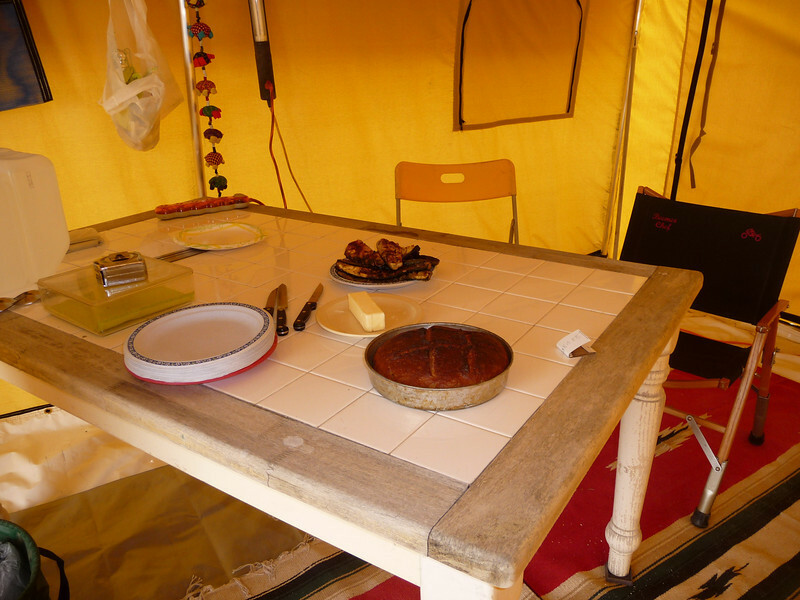 We planned to visit the Big Tent while the weather was good. Rain was due to move in on Monday and stay all week. UGH! Sharon and I left our bikes chained together at Silly Al's, I hopped on the back of the trike and Sharon into her car with Bob. Marsha and Marion headed out in their Jeep. We all ran into one another from time to time as we wandered the tent and outside vendors. Stu & I picked up some brochures on Alaska, talked to tour operators about Mexico tours and I found my mesh outback style hat. We didn't buy much else...everything we wanted was too big to carry back on the bike. LOL! We got back with both bikes, opened a couple of bottles of beer - Fireman's 4 was the one for the day - and sat outside enjoying the fresh air until it got too cool to enjoy. Still no great sunset photos...too heavy a cloud bank again. Today we will take it easy but eventually take the truck down to the event and pick up those items we wanted that were big & bulky. One thing I have been really been wanting is vents to cover our fantastic fans with the rain sensors. There are times you want them open but it's raining. With the vent covers we can do that. 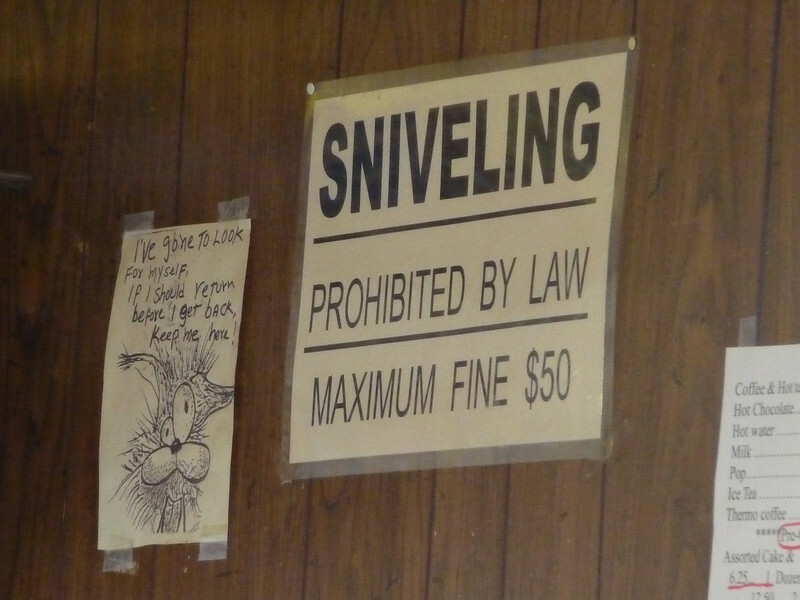 Needless to say, we found them much cheaper here than at Camping World or any other online site I found. We also found a really needed walking stool...something I desperately need when doing a lot of event type walking. My back really stiffens up and a couple of minutes of sitting and stretching the lower back really helps. These are sturdy and look like they will last much longer than the cheaper ones we've seen everywhere. We plan to get two of them...and a discount for that. LOL! 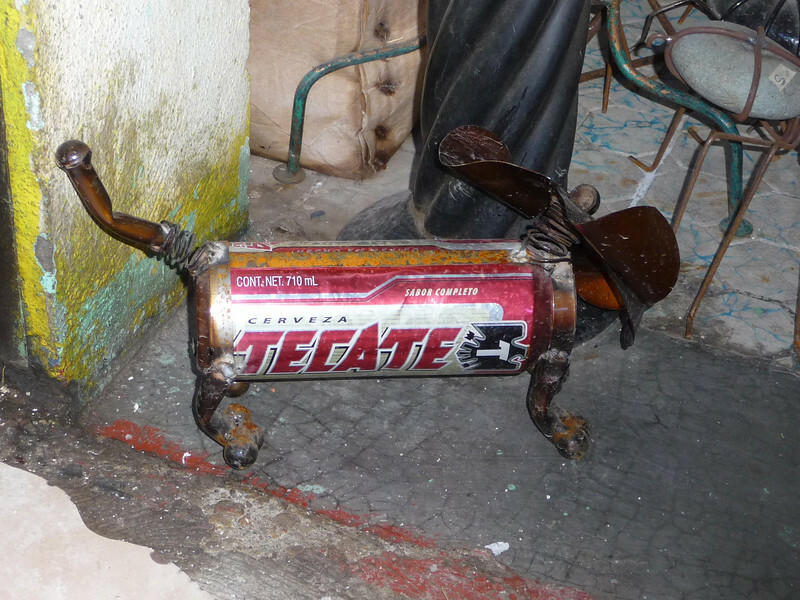 The other item we keep looking at is the Campfire in a Can (one brand name, several others available). I don't think we will get it but out here it would be nice. I think I'd rather spend the money on my Kindle reader. Hee-hee! Okay, enough blathering for the day. If I ever get any pics I will post them in a new blog. 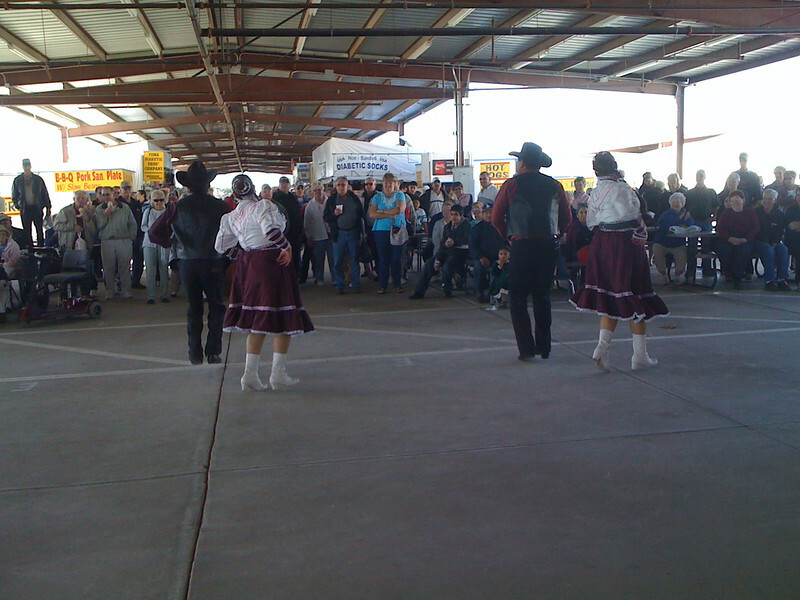 Doubt I will blog again, other than for photos, until we move to Yuma on Wednesday...two days early thanks to the rain. We are enjoying it here though! On the road again, Quartzsite tomorrow! 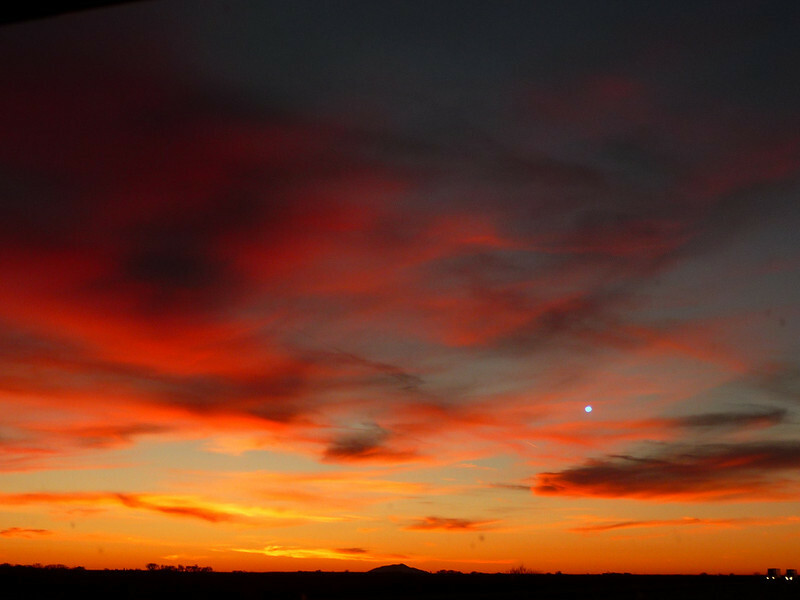 We've had a couple of busy days....we had a great drive from Deming, NM to our current location. 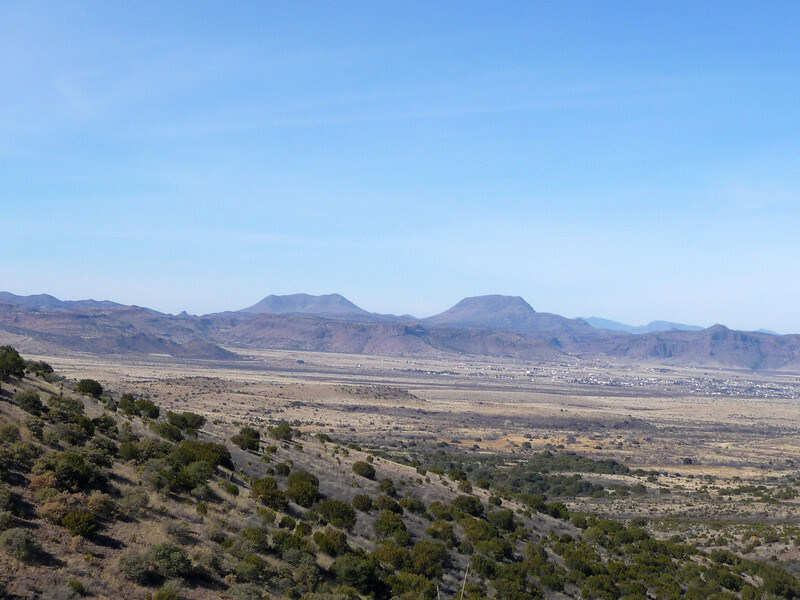 We did change our destination and instead of heading to Tucson we ended up in Huachuca City, AZ. Our thought was we'd be closer to the sightseeing we wanted to do. 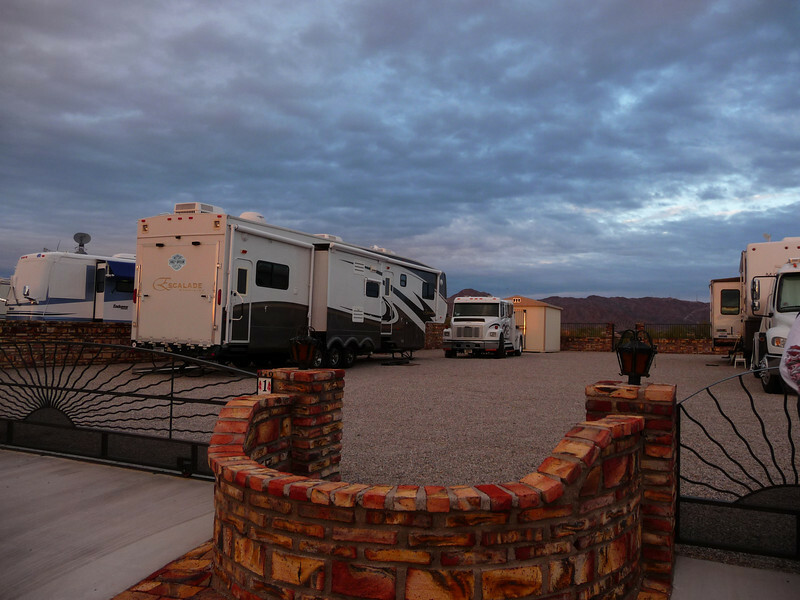 We stayed at the Tombstone Territories RV Park, another Passport America stay. I had stayed here in 2007 and knew it was a good spot for us...LONG pull-throughs, quiet area, great for walking (which we did). While here we've had a great day of sightseeing, another good day of catching up on chores & errands. Thus no blogging....LOL! 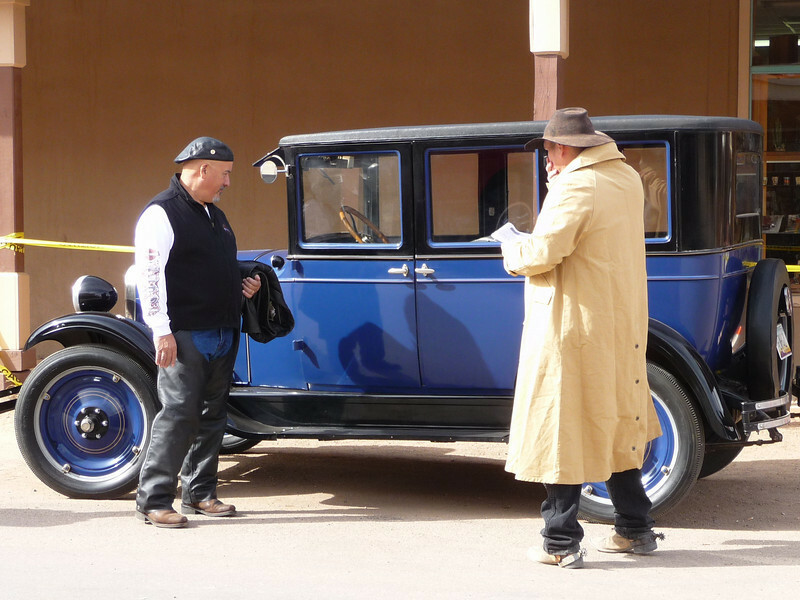 We took the trike out on Wednesday and headed out to visit Tombstone and Bisbee. 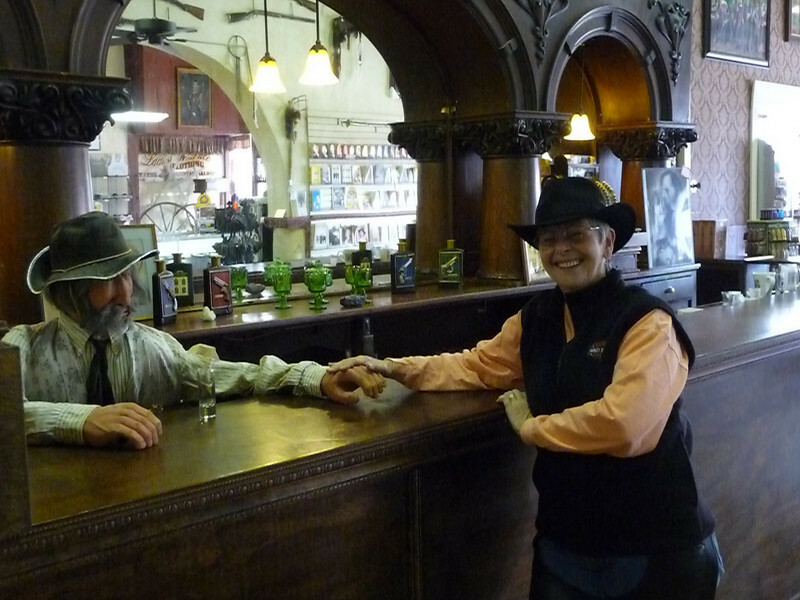 I had been to Tombstone but not Bisbee. There were a lot of closed stores in Tombstone and needless to say the crowds weren't there. We ate at the same place I did, Big Nose Kate's. Stu tried the 1554 beer from the same brewing company of Fat Tire (that Stu tried in MT last summer). The food wasn't as good as I remember but this time around there was a singer. We really enjoyed him...Rusty was his name...and even asked if he had a CD. He did but he was out and told us to stay in touch via the restaurant's website. 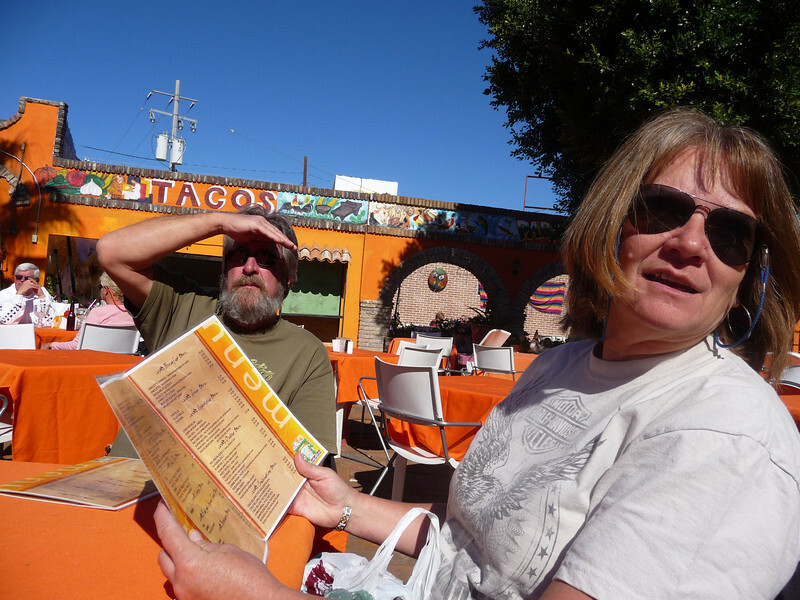 We then headed out to Bisbee, the weather had warmed to the mid-60's and it was really nice. But it definitely got cooler as we headed into Bisbee and we were greatly disappointed at the number of closed shops we saw...or couldn't see. We did manage to park in front of a spot that served Moose Drool beer, so Stu was happy. LOL! We saw a little snow still on the side of the mountains...the ones that we were riding in, NOT the ones in the distance. The next morning I woke up before sunrise and grabbed a couple of photos. Today was chore and errand day. Stu had several repair/maintenance things to do and I had to tackle the cleaning, laundry, bills, phone calls, etc. Later in the day we ran into Sierra Vista to Radio Shack & Lowe's to pick up the last things Stu needed to finish his repairs. By the time we headed back the weather system was all around us...rain, snow, rainbows and gorgeous cloud formations. We love the vista of views here. 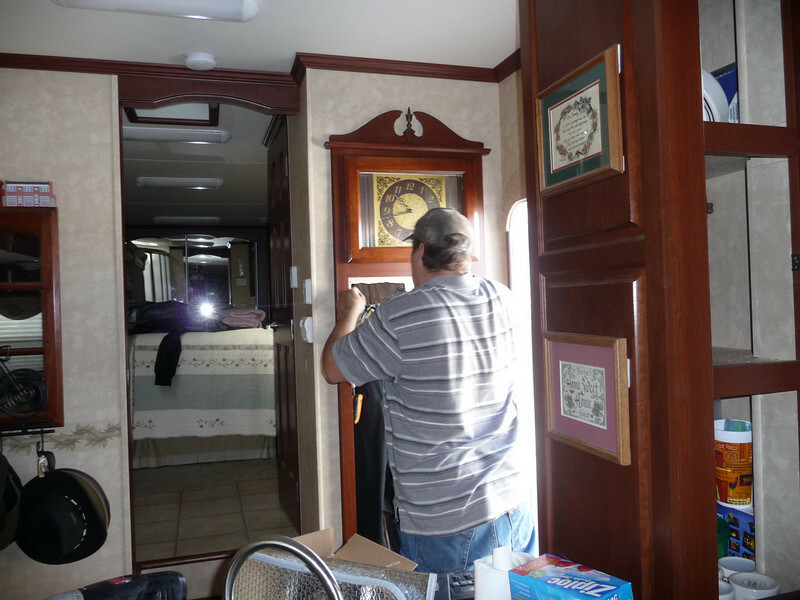 Now we are packing up again, heading out this morning for Gila Bend and Augie's Quail Trail RV Park (I've stayed there several times). It's less than 200 miles, a nice day for us. 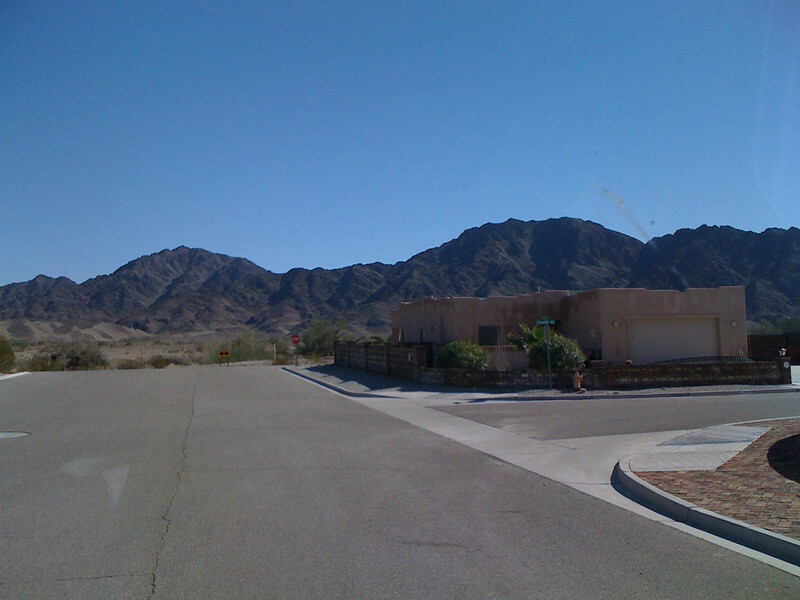 Tomorrow we'll do the last 130 or so miles into Quartzsite with a Wal-Mart stop along the way. We headed out of Marathon this morning after picking up our mail at the local Post Office. Our sewer hose was frozen almost solid but since Stu figures it's worked through 4 rigs over 12 years, it didn't owe us a thing. Tossed it out with the other garbage....LOL! The day warmed up into the mid-50's and mostly sunny. Nice driving, nice scenery (I have pics but a slow connection so will load them later). We stopped several times to stretch our legs. We had originally planned to stop outside El Paso for the night but since we had already moved into Mountain Time Zone, we decided to press onward to the Escapee park, Dream Catcher, in Deming NM. We did stop at the Camping World in El Paso and picked up a new sewer hose. We also finally bought a folding extension ladder since it was on sale. We can now get rid of the clunky one....this one folds to a very long, narrow profile and can easily be stored in either our basement compartment or in a PVC tube under the rig. Our next stop was Barnett's Harley-Davidson in Las Cruces, NM. Stu is trying to get a t-shirt (or some article of clothing) from every state. He found a great one for 50% off. Sweet!!! The sun was quickly setting as we left the HD dealer and before we knew it, Mother Nature was putting on a great show for us. 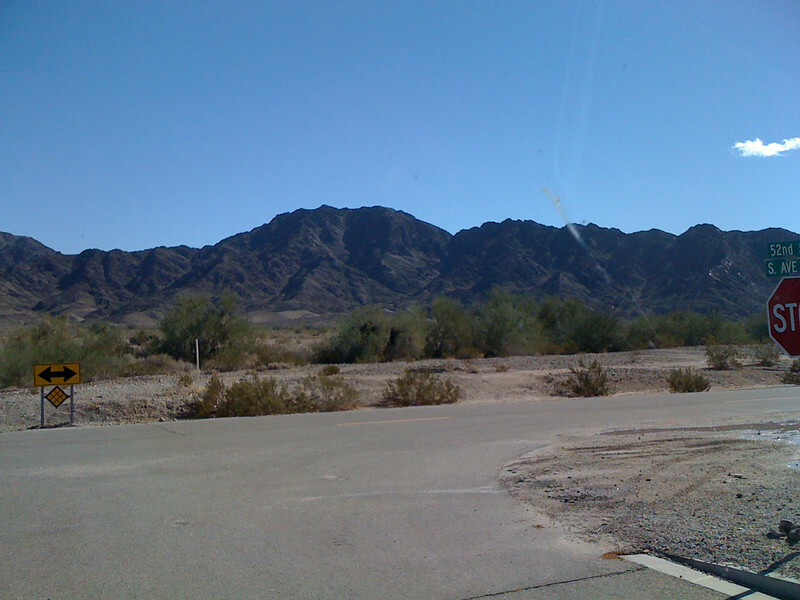 I snapped several shots outside the truck windshield and told Stu to expect even better ones when we get to Quartzsite. 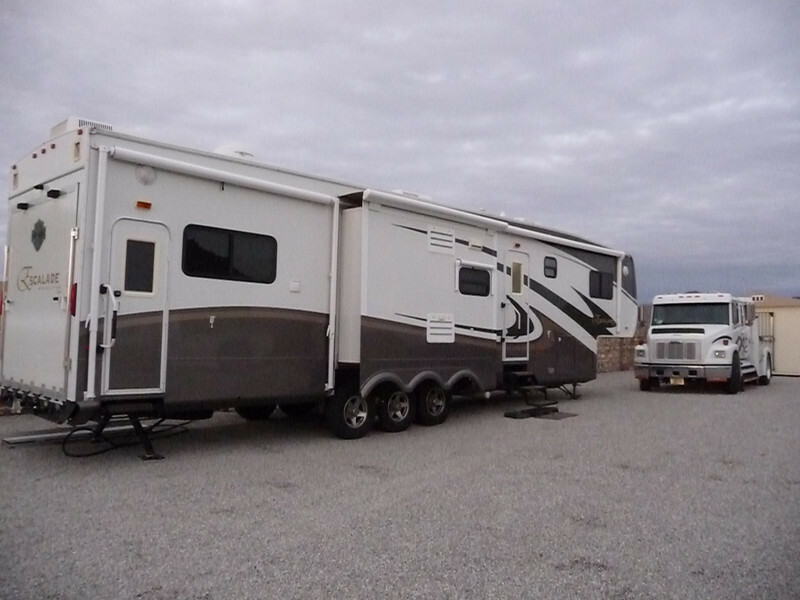 We have changed our original route and are heading to Tucson and Doc Justin's Diamond J RV Park. I haven't stayed there but did visit friends there two years ago. Nice park, out in the country a bit so quiet...lots of wildlife. It' supposed to be upper 60's to low 70's so we can get the bikes out for a bit. 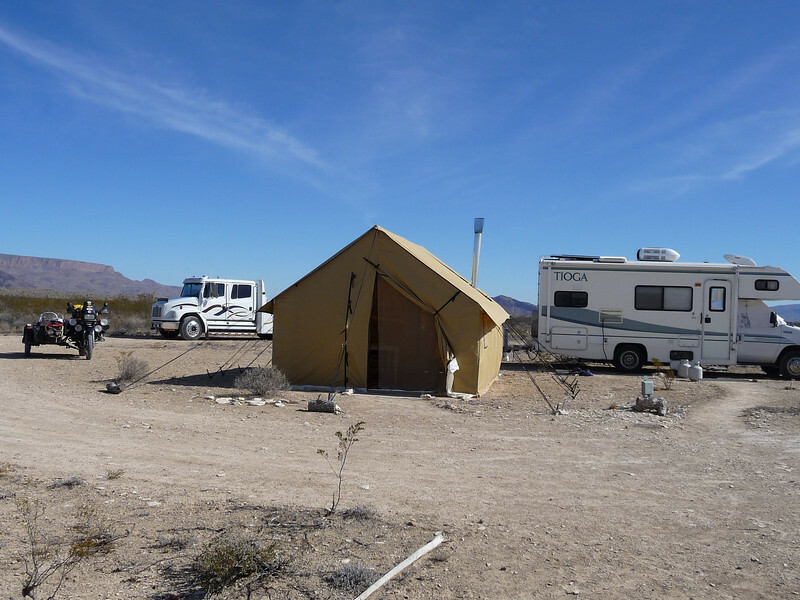 We'll stay three nights and then book it to Quartzsite on Friday. Oh, my friend Ara put up some photos of us on his blog today. Check it out! Another cold night, made it down to 12 degrees. This is our last day here and we wanted to visit a good friend of mine, Ara & his pup, Spirit. I first met Ara two years ago when I first headed out on the road. We did some riding together (I had my BMW motorcycle then) and have maintained a loose email friendship. 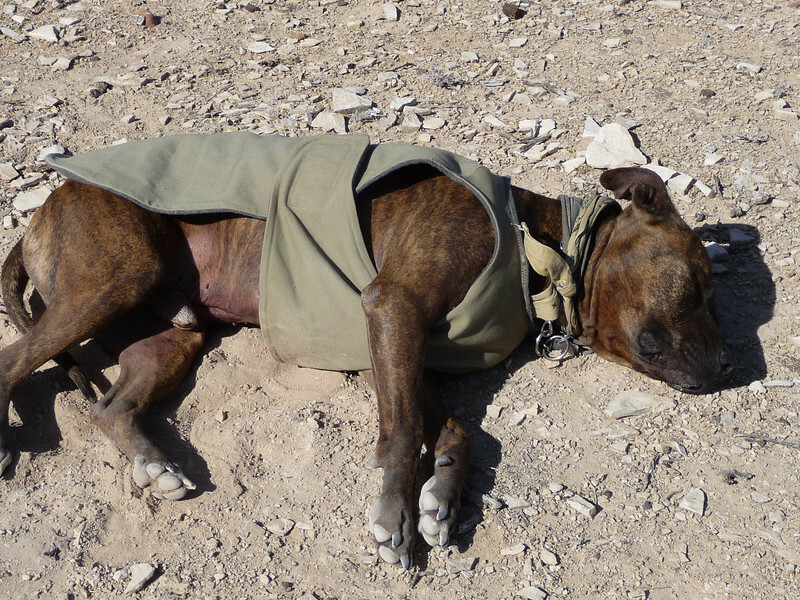 Ara had picked up some land just outside Big Bend National Park and not too far from the quirky town of Terlingua. He is boondocking in style....a cargo container for his valuables (you don't leave anything out when you leave your land), a tent for enjoying a little more room than the small Class C he normally travels in, and a great firepit area for cooking and conversation. 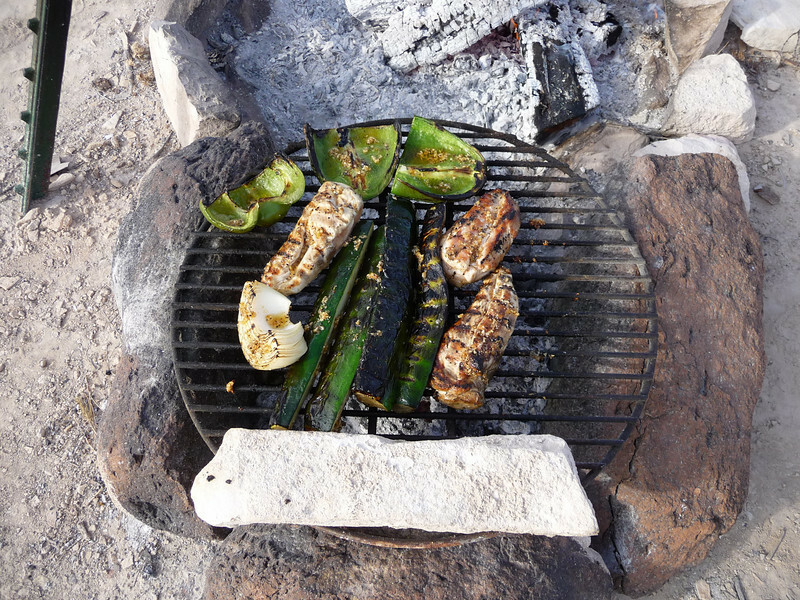 We headed into Alpine and picked up some chicken breasts, zucchini, green peppers and sweet onion. 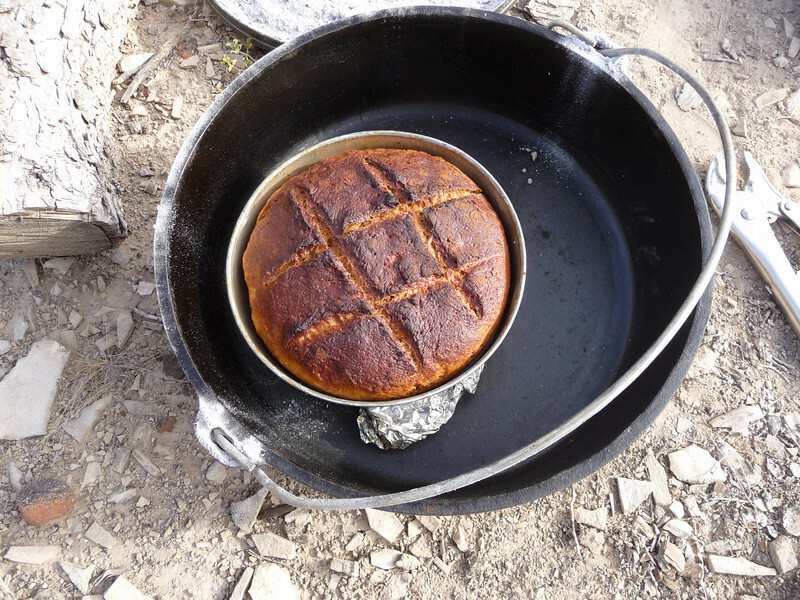 Ara was planning on firing up the pit for cooking, he already had the bread started. The drive was about 90 minutes and we started to really get a flavor for the beauty of the area. 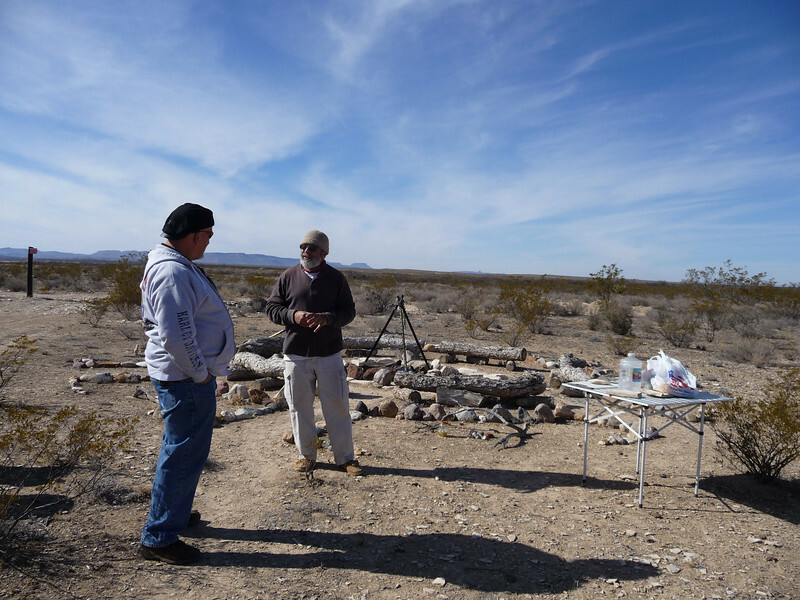 We met Ara at the local American Legion and followed him in to his land. We spent several hours just gabbing, catching up to date, and watching our dinner cook. Ara was a professional chef and he whipped up a marinade that had our mouths watering way before the food was done. LOL! About the time dinner was done the temperature decided to take a decided dive. 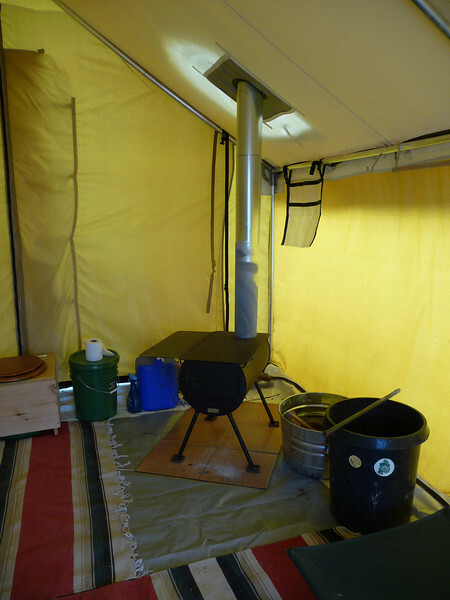 We moved into the tent to eat and after dinner Ara lit the wood stove to keep up toasty. All in all a great day, too short and a bit too cool, but still a great day for sure!! Be sure to check out Ara's journal and enjoy his gorgeous photos! Where did the warm weather go?